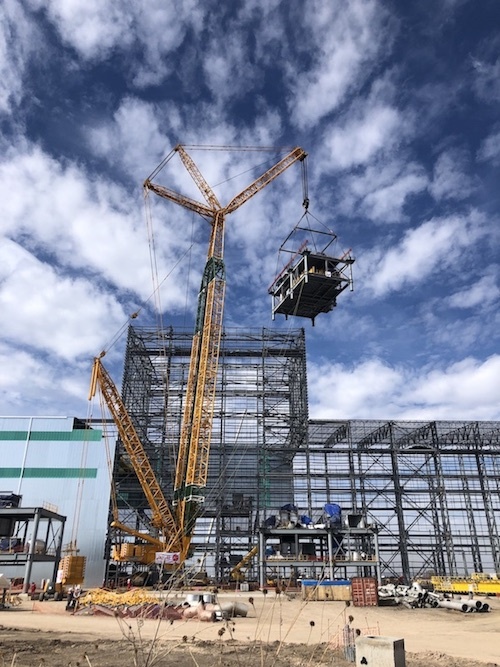 The heavy lift specialist Ale was contracted to lift modules, ranging from roof panels to plant modules including several items that were weighing up to 300t each (330 US tons) as a part of a bigger construction project for a new steel mill plant in Silao, located within the northern state of Guanajuato, Mexico. To execute this lifts Ale used a Liebherr LR11350 crawler crane, maximum lift capacity of 1,350 ton, with P boom. According to the heavy lift services provider, by using this configuration, they were able to minimise congestion on site and enable construction work to continue. As the client to continue other work without crane pad interfering, overall project costs and build schedules were optimized.